Fandango Rewards loves the movies and, more importantly, loves to provide products that surprise and delight and change consumer behavior. With more than one billion movie tickets, digital movie and music downloads and e-gift cards issued, we can turn the casual buyer of your brand or service into a loyal customer. Our campaigns can be customized to fit your needs, including frequency purchases, acquisition/retention, reward/rebates, gift with purchase or sweepstakes promotions. We strive to create exciting consumer experiences and creative solutions to fit any brand's promotional goals and budgetary needs. The Fandango Rewards movie ticket is world’s most accepted movie reward with more than 36,000 movie screens in the U.S. Our movie reward product also comes with no restrictions or blackouts and expands to include mobile and reserved movie tickets. 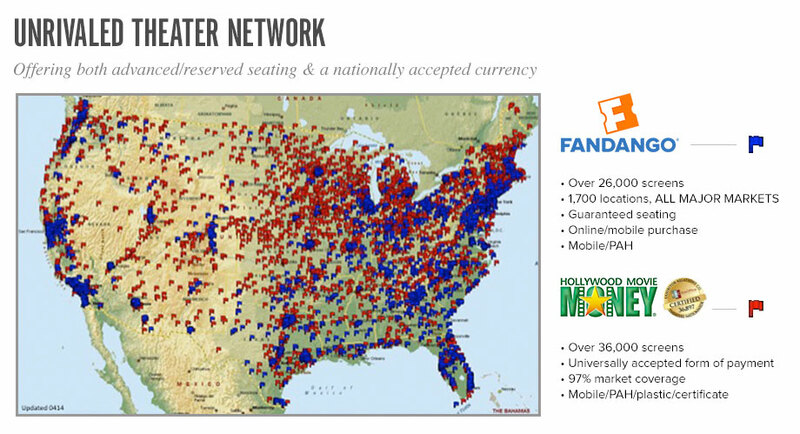 Fandango Rewards promotional codes can provide rewards through various delivery channels, including in-pack and on-pack, online, via Catalina Marketing, mobile receipt validation, pre-printed movie tickets, collectible cards or through a MasterCard® or Visa® prepaid card. We provide you the flexibility to choose the format that best suits your program needs. Want to know more? Visit www.fandangorewards/tryus for more information or speak with a sales representative.